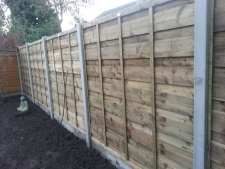 Paul Gibbons Landscapes Ltd can guide you every step of the way providing you with ideas for your fencing requirements. Whether you need an existing fence and/or gate replaced or a new fence and/or gate erecting, we will be happy to supply quotations for different options. We want you to be fully satisfied with our work and will not expect final payment until the project is completed to your full satisfaction. We supply a 5 year guarantee on all our work. 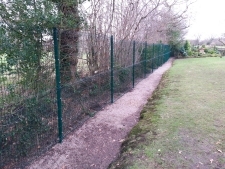 We work on a supply and install or install only basis, and will install any type of fencing products of your choice. Many can be seen in building merchants, timber suppliers and DIY stores. We prefer to use fencing products that reflect the quality of our installation to suit any purpose, any property and any budget. We can erect any type of fencing, including the popular Super waneylap, waneylap, vertical board or picket fencing, trelliswork, pergolas, archways, sheds and gazebos as part of a garden landscape from architects drawings or as a stand alone project. Our timber gates are made using good quality timber and made to measure by a local timber merchant. Many are concerned about the security of their home as well as their families. Security fencing is an excellent solution that guards against intruder access into your home. Those concerned about the reliability of security fencing can rest assured, the days of intimidating, ugly metal fencing are gone. Today’s security fencing is sophisticated, versatile protection equipment for modern residences and facilities.